Understand the difference between a stain and a varnish and when you should use them to get the finish you are looking for. 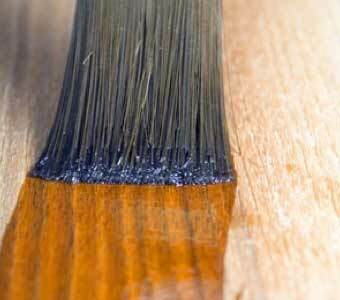 We explain how both stains and varnishes work so that you can see when and why you should use them. We also explain the common types of varnish that you would use in your home improvement projects so that you can choose the right one. This is the complete guide to using stains and varnish. A varnish is a finish and protecting film that is typically associated with wood, but can be used on other substrates also. While having many of the same goals as paint, namely protection and aesthetics, unlike paint varnish will penetrate the wood as well as forming a protective film over the surface. Varnishes are not coloured like a paint. In this project we focus on varnishes, and if a colour is needed, stains. We will explain when and how to use your stain with your varnish to get the best finish. Varnish Ingredients – What Makes Up Varnishes? In essence, varnish is basically a paint without the pigment applied to it. The majority of these are polyurethane based resins and are solvent based (similar to oil paints). Acrylic varnishes, although water based, are becoming more popular for their environmental and health benefits. The more thinners there are the more liquid the varnish will be, which is not necessarily a good thing, unless the varnish is to be applied by spraying which will need a thinner mixture. A thicker varnish will be more viscous and allow a thicker more durable coat. Similar to paints, varnishes are also available with a satin/silk or high gloss finishes, either clear or with the addition of a very small amount of colour. 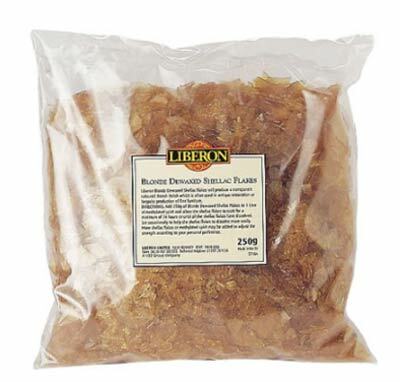 This will be determined by the choice and amounts of oils to resin used in the mix, but flatting agents are often needed too to take off the gloss. Generally varnishes are clear, and a stain is used before applying the varnish, if colour is needed. Varnishes with added colour are often intended to enhance the appearance of wood, or even give it some extra colour, which is easier and quicker that staining and then varnishing in t two step process. As we have already discussed the different ingredients or component parts of the varnish will have the biggest influence over these hardening processes and the time it takes. Also there are a range of additives that are used to affect these properties and others favourable properties such as colour, flexibility, UV protection and many more. The biggest factor under our control (to a degree) is the temperature and humidity, so this is worth considering. Read the instructions on the specific varnish you’re using for further guidance, however as a general rule of thumb higher temperatures and lower humidity will speed up curing times. This might not be as good a thing as you think, because if a varnish hardens too quickly it might become brittle, which is why we refer you to the instructions. Before you start to apply any varnish, ensure that the surface is well prepared; varnish accentuates rather than hides marks, unwanted stains and bumps. Sand the surface down with a medium or course grit sandpaper before filling any cracks. Then sand down again with a medium grit paper. If you are sanding and varnishing a floor then have a look at our project and videos on sanding floors here. Varnish is also its own primer and undercoat, although in some cases it is better to thin the first coat with roughly 10% white spirit (for solvent varnishes) and water for water-based varnishes. This is particularly true if you are using a polyurethane varnish. In most cases it is also better to apply this with a lint free cloth and you are able to rub the varnish into the wood grain better than you could do with a brush. Once the first coat has been applied and it has dried, it then has to be keyed (rubbed down lightly) and a second coat is then applied (without dilution). Dust and varnish don’t mix, which is a shame because all the sanding before applying the varnish will inevitably create a lot of dust. Give it time to settle and get rid of as much as possible; if you apply your varnish in a dusty environment it will stick in the drying varnish potentially ruining the finish. If this happens you will have to sand it down gently with a fine grit paper and then apply another coat. Unlike paint, varnishes and stains are designed to soak into the wood. You can even apply a clear varnish to the stain to improve the finish and also make it more durable. These are also available in solvent and water based variations and also in a variety of colours and shades. 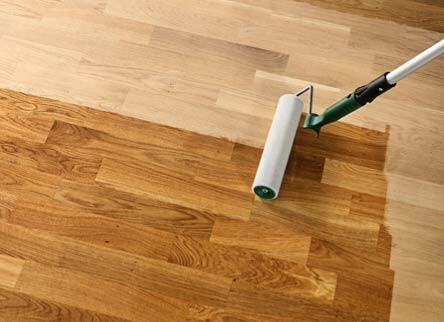 Varnish can be applied with a brush, which is more typical, or a roller. If you are planning to use a roller use one with a short pile. See here for help on choosing a roller. Apply with the grain to get a smooth and even finish. There is a huge range of different varnishes out there and different manufactures will call them slightly different things to make it even more confusing. Alkyd Varnishes – This is a terms that you will sometimes hear, and most varnishes will contain an alkyd of some kind. They are modified natural or vegetable oils. Much like paint, varnishes have finishes that vary from “Gloss” through “Satin” to “Matt”. This describes the sheen of the finish and how reflective it will be. Gloss is the shiniest and smoothest, while Matt describes a dull and un-shiny finish. Thankfully nowadays all commercially produced varnishes are of exceptional quality and will perform very well in the right setting. Follow the description on the tin; interior varnish should not be used outside because they will not have suitable UV resistance and characteristics to withstand the elements. Floor varnishes might be too hard and prone to cracking if use on exterior wood that is likely to need some flexibility, and it is likely to degrade in the increased UV light. A yacht varnish will not be hard enough for use on a high traffic floor and wear out faster than it should. Remember that varnish is a mixture of Oils, Resins and Thinners, with a range of additives that has been developing over hundreds if not thousands of years. A quick search of the internet and you will be able to find recipes for making your own varnish! Hopefully with a good understanding of what the various elements do, you will understand how the various characteristics that the manufacturers’ have developed in their varnishes can be best used. A (wood) stain is very similar to a paint; it is designed to colour the substrate, although it does not leave a protective film as it is designed to be absorbed. Because it is absorbed, it means that the grain will be seen through the colour and the extent of this is largely dependent on how opaque the pigment in the stain is. Make sure that the stain is thoroughly mixed before you start to apply it so that you get an even colour throughout. Just as the process for preparing to varnish we described above, the surface needs to be prepared thoroughly. Fill all the cracks and sand down with a medium grit. Ensure that you use a filler that will accept the stain or it will show as an unstained patch in the stained surface. As mentioned before, stains are often applied with a lint free cloth. This aids in the blending and coverage of the finish, but you will have to work quickly to blend the wet and dry edges together to avoid any hard lines and overlaps. A water based stain will also raise the fibres on the surface of the wood which in many cases also spoils the evenness of the colour. Work with the gain rather than across it, and ensure that you do not overload your brush or cloth as this might cause drips. You want to try and get as even a spread as possible so that you get an even colour across the surface; drips will ruin this if you do not catch them in time. Sand down lightly after the first application and if necessary apply another coat. This will make the colour bolder and darker. We would strongly recommend practicing on an off cut to get the measure of the stain before you start on the real thing, especially if you’re not familiar with using stains. Even if you are, it is important to see how the stain will work with your particular wood you are using. It is possible to mix stains to make your own unique colour. Make sure that don’t mix oil and water stains; they will not mix. If you try this you will absolutely need to test in on an off cut first! That said there are a huge variety of stains available, so you can probably find what you are looking for without going to the hassle of making it – see a wide variety of stains here. 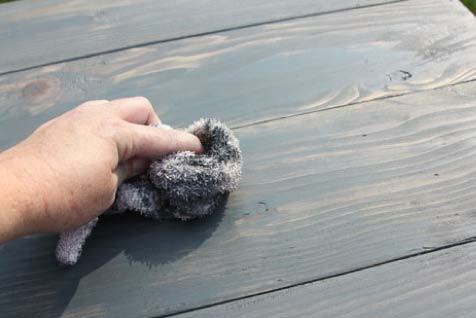 You will always apply the stain before applying the varnish, unless the varnish already has the stain mixed into it. Allow sufficient time for the solvent to fully evaporate before applying the finishing coat of say, varnish. If it is wet or cold we suggest that you leave another 24 hours over the manufacturers’ recommended drying time to be 100% safe. 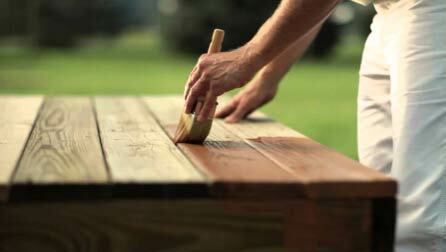 Remember any product designed to permanently stain wood will have no trouble doing the same to your skin and fingers. The solvent will not be pleasant on your skin either so we recommend that you take care using stains, and definitely use rubber gloves and overalls. A brave man applying wood stain while wearing white trousers (and no gloves)! In summary, the stain provides the colour and a varnish provides the hard coating to protect the surface. These two functions are achieve in a single product with paint, however paint sits on the surface, where are both varnish and particularly stains are absorbed by the surface. This means that stains in particular are a more permanent form of colouring as it will be next to impossible to remove them.